League Two leaders Wycombe remained at the summit with a comfortable victory against bottom-of-the-table Hartlepool. Pools' Neil Austin missed a first-half penalty following Joe Jacobsen's foul on Marlon Harewood, after Paris Cowan-Hall had put Wycombe in front. Matt Bloomfield drilled a low shot on 76 minutes to double the lead and a header from defender Alfie Mawson made it 3-0 to the Chairboys. Harewood headed in a consolation for the Pools with seven minutes left. The win is Wycombe's seventh away victory of the season, one more than they managed in the whole of last season. "It was a really tough game. I warned the boys what was coming. "We had to dig deep and take the onslaught before we came into the game. "They missed a penalty but I still think we would have gone on to play like we did if that had gone in. "Second half, we were just the better team by far, we attacked well and some of the moves we put together were awesome." Match ends, Hartlepool United 1, Wycombe Wanderers 3. Second Half ends, Hartlepool United 1, Wycombe Wanderers 3. Sido Jombati (Wycombe Wanderers) wins a free kick in the attacking half. Corner, Hartlepool United. Conceded by Aaron Pierre. Attempt blocked. Jonathan Franks (Hartlepool United) right footed shot from outside the box is blocked. Corner, Wycombe Wanderers. Conceded by Jordan Richards. Corner, Wycombe Wanderers. Conceded by Matteo Lanzoni. Corner, Wycombe Wanderers. Conceded by Neil Austin. Attempt missed. Aaron Pierre (Wycombe Wanderers) header from the centre of the box is close, but misses to the left. Goal! Hartlepool United 1, Wycombe Wanderers 3. Marlon Harewood (Hartlepool United) header from very close range to the high centre of the goal. Assisted by Jonathan Franks. Scott Fenwick (Hartlepool United) wins a free kick in the defensive half. Substitution, Wycombe Wanderers. Fred Onyedinma replaces Paris Cowan-Hall. Sidney Schmeltz (Hartlepool United) is shown the yellow card. Paris Cowan-Hall (Wycombe Wanderers) is shown the yellow card. Sidney Schmeltz (Hartlepool United) wins a free kick in the defensive half. Goal! Hartlepool United 0, Wycombe Wanderers 3. 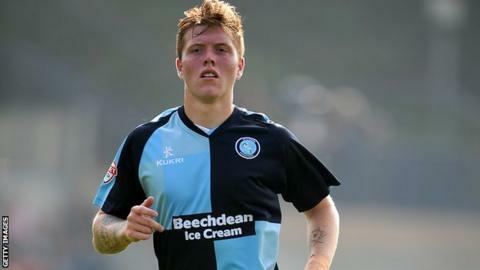 Alfie Mawson (Wycombe Wanderers) header from the centre of the box to the bottom right corner. Assisted by Joe Jacobson with a cross. Goal! Hartlepool United 0, Wycombe Wanderers 2. Matt Bloomfield (Wycombe Wanderers) right footed shot from the centre of the box to the bottom right corner. Assisted by Paul Hayes with a cross. Attempt saved. Paris Cowan-Hall (Wycombe Wanderers) right footed shot from outside the box is saved in the bottom right corner. Foul by Sidney Schmeltz (Hartlepool United). Hand ball by Steven Craig (Wycombe Wanderers). Attempt saved. Jonathan Franks (Hartlepool United) right footed shot from outside the box is saved in the centre of the goal. Hand ball by Josh Scowen (Wycombe Wanderers). Neil Austin (Hartlepool United) wins a free kick on the right wing.